The ancient Aryan Molossus has close ties with the Sage Koochee and old Persian mastiffs, as well as other Central Asian dogs, but this is a pure and distinct Afghani breed, likely older than the rest of its relatives. An excellent watchdog and guardian, this remarkably powerful mastiff is most commonly employed as a fighting dog, used to settle various disputes among villagers, who respect the outcome of the match as the final judgment. If there is a feud between tribes and settlements, each party brings their own dog to represent them in the fighting ring. This way, the issues get resolved without human casualties. The Mazari Fighting Dog is a very rare breed today, seen only in the mountain regions of Afghanistan, where they were taken during the Soviet occupation, because the Russians were systematically destroying the aggressive indigenous dogs. 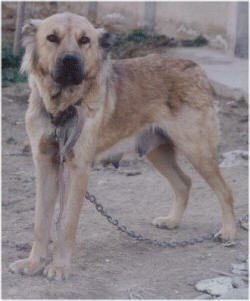 While the Asal blood has made its way into the other types of what is considered the greater Central Asian Shepherd breed, namely the Kooche and Alabai variants, the breed itself is kept pure and isolated from other dogs and the bloodlines are maintained and guarded jealously by the few Mazarii families who tend to trade dogs between each other, rarely, if ever selling their dogs to outsiders. In some ways closer to the Caucasian dogs than the CAO breed, the mighty Asal is an athletic and muscular Molosser, extremely aggressive towards other dogs and intolerant of strangers. Due to its vicious nature, it is handled only by its owner, or a designated village dog expert. Large-headed and well-boned, the Khurasani Dog has a strong and lean body, with long legs and a deep chest, somewhat wolf-like in appearance. The ears are usually cropped and the tail can be either docked or left unaltered, with naturally short-tailed dogs being most valued and considered the only pure ones by the breed fanciers. The Mazarii Mastiff has a very dense, plush, medium-length coat, usually uniform grey-sable, reddish-brown, fawn, white or brindle in colour. White markings are acceptable on the muzzle, feet and chest, as are darker patches on white dogs. The females, who come into heat only once a year, are much smaller than the male dogs, whose average height is around 32 inches, although some specimens can reach up to 35 inches at the withers.